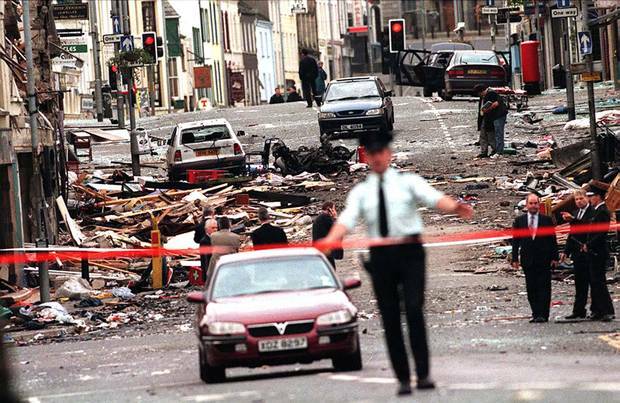 19 years on from the Omagh bombing, numerous questions remain unanswered. The Government has been less than forthcoming with answers and instead have used the court process to restrict information in relation to informants involved in the atrocity becoming public. The murderous attack, masterminded by a breakaway faction of the South Armagh/North Louth IRA controlled by Micky McKevitt, resulted in the deaths of 29 innocent people in Omagh. The families have relentlessly campaign for truth and justice, and still to this day no one has been ultimately convicted of participation in the heinous act of terrorism. In the aftermath of the bombing a registered CID informant, Kevin Fulton, revealed that he had passed details of the potential bombing to his handler. At this time Mr Fulton was, it is understood, behind handled by CID officer Alan Mains- a close friend of the then RUC Chief Constable Ronnie Flanagan. Mr Mains was using Kevin Fulton as part of a CID operation to entrap businessman Luigi Marotta. Mr Marotta’s conviction was eventually overturned after the Police refused to reveal details of the CID operation involving Kevin Fulton and his handler. It is understood that tapes may exist that would have exposed the conspiracy to entrap the businessman. Alan Mains and Kevin Fulton both appeared at the Smithwick tribunal, which was set up to investigate the IRA murder of senior RUC officers Harry Breen and Bob Buchanan. The tribunal was not informed that Mr Main’s was formerly Mr Fulton’s handler. It is imperative, in the search for the truth, that the flow of information from informants to their handlers and the activities of security force agents is fully exposed. One of the masterminds behind the bomb is IRA mass killer Colm Murphy. Rumours have circulated in recent years that the Louth republican is a long-time MI5 agent who was recruited in 1985 following a spell in prison for arms offences. He is the chief suspect in the Kingsmill massacre. 166 Responses to "NEWS: Omagh bomb- Fulton’s handler should come clean on ‘warning’"
Hello There. I found your weblog the use of msn. This is a really well written article. I will be sure to bookmark it and come back to learn more of your helpful info. Thanks for the post. I will certainly comeback. I am curious to find out what blog system you are utilizing? I’m experiencing some minor security issues with my latest website and I would like to find something more secure. Do you have any suggestions? Thank you, I’ve just been searching for information about this subject for a long time and yours is the best I’ve came upon till now. But, what concerning the bottom line? Are you sure in regards to the supply? This is the fitting weblog for anyone who wants to seek out out about this topic. You notice so much its nearly arduous to argue with you (not that I really would want…HaHa). You undoubtedly put a brand new spin on a subject thats been written about for years. Great stuff, just nice! Aw, this was a really nice post. In idea I would like to put in writing like this moreover – taking time and actual effort to make a very good article… however what can I say… I procrastinate alot and under no circumstances seem to get one thing done. Hi there, You have performed a great job. I will certainly digg it and in my opinion recommend to my friends. I am confident they will be benefited from this site. My spouse and i got ecstatic that Louis could deal with his analysis using the precious recommendations he made out of the blog. It is now and again perplexing just to be giving away solutions which usually people today have been making money from. We do understand we have got the blog owner to be grateful to because of that. The specific explanations you have made, the simple website navigation, the friendships you will make it easier to create – it’s got everything incredible, and it’s really facilitating our son in addition to the family recognize that the theme is enjoyable, and that’s quite vital. Many thanks for the whole lot! What’s Taking place i’m new to this, I stumbled upon this I’ve found It absolutely helpful and it has aided me out loads. I am hoping to give a contribution & help other customers like its aided me. Great job. What’s Happening i’m new to this, I stumbled upon this I have found It positively helpful and it has aided me out loads. I hope to give a contribution & aid different customers like its aided me. Good job. It’s perfect time to make some plans for the longer term and it’s time to be happy. I’ve read this submit and if I may just I desire to recommend you few interesting issues or tips. Perhaps you can write next articles regarding this article. I wish to learn more issues approximately it! After research a number of of the weblog posts in your web site now, and I really like your way of blogging. I bookmarked it to my bookmark website list and will be checking again soon. Pls take a look at my website as well and let me know what you think. am reading this wonderful piece of writing to improve my know-how. I have read so many articles regarding the blogger lovers but this post is really a nice post, keep it up. Simply wish to say your article is as astonishing. The clearness in your post is simply spectacular and i could assume you are an expert on this subject. Fine with your permission let me to grab your feed to keep updated with forthcoming post. Thanks a million and please keep up the rewarding work. Almost all of whatever you assert is supprisingly appropriate and that makes me ponder why I had not looked at this in this light before. This piece truly did switch the light on for me as far as this specific issue goes. But at this time there is actually one particular point I am not too comfortable with and whilst I try to reconcile that with the core theme of the position, let me observe what all the rest of the readers have to point out.Very well done. Have you ever considered about including a little bit more than just your articles? I mean, what you say is valuable and all. However think of if you added some great photos or video clips to give your posts more, “pop”! Your content is excellent but with images and clips, this site could definitely be one of the very best in its niche. Awesome blog! You made certain good points there. I did a search on the theme and found most people will agree with your blog. After study a handful of the content on your web site now, and that i really like your way of blogging. I bookmarked it to my bookmark website list and will also be checking back soon. Pls look at my internet site too and told me what you think. It’s appropriate time to make some plans for the future and it’s time to be happy. I have learn this put up and if I may I desire to counsel you some attention-grabbing issues or advice. Maybe you could write subsequent articles relating to this article. I want to learn more issues approximately it! You really make it seem really easy together with your presentation but I in finding this matter to be actually something which I think I might never understand. It kind of feels too complicated and very vast for me. I am having a look forward to your next publish, I’ll attempt to get the hang of it! Wow! Finally I got a blog from where I know how to in fact take valuable facts concerning my study and knowledge. Thank you a lot for giving everyone an extremely special chance to check tips from this blog. It can be very fantastic plus jam-packed with amusement for me personally and my office fellow workers to visit your website at the very least thrice every week to read through the fresh stuff you have. And definitely, we are actually happy concerning the magnificent tips and hints you serve. Some 3 tips in this article are indeed the most effective we have had. It’s actually a nice and helpful piece of info. I’m satisfied that you just shared this helpful information with us. Please stay us up to date like this. Thank you for sharing. Thanks for sharing excellent informations. Your site is so cool. I am impressed by the details that you’ve on this site. It reveals how nicely you perceive this subject. Bookmarked this web page, will come back for more articles. You, my friend, ROCK! I found simply the info I already searched everywhere and simply could not come across. What a great website. Magnificent website. Lots of useful information here. I’m sending it to some friends ans also sharing in delicious. And of course, thanks for your effort! Thanks for any other informative web site. Where else may just I am getting that type of info written in such a perfect way? I have a mission that I am just now operating on, and I’ve been on the glance out for such info. Hey! I know this is kinda off topic but I was wondering which blog platform are you using for this site? I’m getting fed up of WordPress because I’ve had issues with hackers and I’m looking at alternatives for another platform. I would be awesome if you could point me in the direction of a good platform. Thanks for another excellent article. Where else may just anybody get that type of information in such an ideal means of writing? such specific approximately my problem. You are incredible! Hi, I think your site may be having web browser compatibility issues. but when opening in IE, it’s got some overlapping issues. I simply wanted to provide you with a quick heads up! of course like your web site but you need to check the spelling on quite a few of your posts. Several of them are rife with spelling issues and I find it very troublesome to tell the truth nevertheless I will definitely come back again. Hello! Someone in my Myspace group shared this website with us so I came to take a look. I’m definitely loving the information. I’m bookmarking and will be tweeting this to my followers! Terrific blog and outstanding design and style. Ichh mag, was euch Regel. Diese Art der Berichterstattung!Halten Sie sich diie hervorragende ausgezeichneten funktioniert Jungs Ich habe eingewbauteuhch zu Blogroll. Hi, Neat post. There is a problem together with your web site in web explorer, could test this… IE still is the marketplace chief and a huge section of other people will miss your fantastic writing due to this problem. certainly like your web-site but you need to check the spelling on several of your posts. A number of them are rife with spelling problems and I find it very troublesome to tell the truth nevertheless I will surely come back again. Its like you learn my mind! You seem to grasp so much about this, such as you wrote the e-book in it or something. I feel that you just can do with a few to pressure the message home a little bit, but other than that, this is magnificent blog. A fantastic read. I’ll certainly be back. It’s really a nice and helpful piece of information. I am glad that you shared this helpful information with us. Please keep us up to date like this. Thank you for sharing. Everyone loves what you guys are usually up too. This sort of clever work and coverage! Keep up the wonderful works guys I’ve added you guys to my personal blogroll. Simply want to say your article is as amazing. The clarity in your post is just spectacular and i could assume you are an expert on this subject. Well with your permission allow me to grab your RSS feed to keep up to date with forthcoming post. Thanks a million and please keep up the enjoyable work. Do you mind if I quote a couple of your articles as long as I provide credit and sources back to your website? My blog is in the very same niche as yours and my visitors would really benefit from some of the information you provide here. Please let me know if this okay with you. Thanks! My brother suggested I may like this web site. He used to be entirely right. This post actually made my day. You cann’t imagine simply how much time I had spent for this information! Thanks! you have an amazing weblog right here! would you prefer to make some invite posts on my weblog? Currently it sounds like BlogEngine is the top blogging platform out there right now. (from what I’ve read) Is that what you’re using on your blog? Good day! This post could not be written any better! Reading this post reminds me of my old room mate! He always kept talking about this. I will forward this post to him. Pretty sure he will have a good read. Thank you for sharing! Do you have a spam problem on this website; I also am a blogger, and I was curious about your situation; we have developed some nice procedures and we are looking to exchange methods with other folks, please shoot me an e-mail if interested. Great goods from you, man. I have consider your stuff prior to and you’re just extremely magnificent. I really like what you have received here, certainly like what you are stating and the way through which you are saying it. You’re making it entertaining and you still care for to keep it sensible. I can’t wait to read far more from you. That is actually a tremendous website. I’ll immediately seize your rss as I can not in finding your email subscription link or newsletter service. Do you’ve any? Kindly let me recognise in order that I may subscribe. Thanks. Hello very cool website!! Guy .. Excellent .. Superb .. I will bookmark your website and take the feeds additionally…I am glad to search out numerous helpful info right here within the submit, we’d like develop more strategies in this regard, thanks for sharing. . . . . .
Good – I should definitely pronounce, impressed with your website. I had no trouble navigating through all the tabs and related info ended up being truly simple to do to access. I recently found what I hoped for before you know it at all. Quite unusual. Is likely to appreciate it for those who add forums or anything, web site theme . a tones way for your client to communicate. Excellent task..
It’s a pity you don’t have a donate button! I’d certainly donate to this fantastic blog! I guess for now i’ll settle for book-marking and adding your RSS feed to my Google account. I look forward to fresh updates and will talk about this blog with my Facebook group. Chat soon! Have you ever thought about creating an e-book or guest authoring on other sites? I have a blog based on the same subjects you discuss and would love to have you share some stories/information. I know my readers would value your work. If you are even remotely interested, feel free to shoot me an email. I’ve been browsing on-line greater than 3 hours nowadays, but I never discovered any fascinating article like yours. It’s beautiful price enough for me. Personally, if all site owners and bloggers made good content material as you probably did, the web will be a lot more useful than ever before. you’re truly a good webmaster. The site loading velocity is amazing. It kind of feels that you’re doing any distinctive trick. Furthermore, The contents are masterwork. you’ve done a excellent job in this topic! I must get across my affection for your kind-heartedness in support of visitors who require help with your subject. Your special commitment to getting the solution throughout appeared to be really invaluable and has in most cases encouraged ladies like me to realize their aims. Your new important instruction indicates a whole lot to me and even more to my fellow workers. Many thanks; from each one of us. conations truly fastidious funny material too. Good way of describing, and nice piece of writing to take facts concerning my presentation focus, which i am going to convey in college. Thank you a lot for sharing this with all people you actually know what you are speaking about! Bookmarked. Kindly additionally visit my website =). We could have a hyperlink trade agreement among us! I visited multiple blogs however the audio feature for audio songs present at this website is actually marvelous. with? I’m going to start my own blog in the near future but I’m having a tough time selecting between BlogEngine/Wordpress/B2evolution and Drupal. I want to suggest you few fascinating things or advice. Maybe you could write subsequent articles regarding this article.